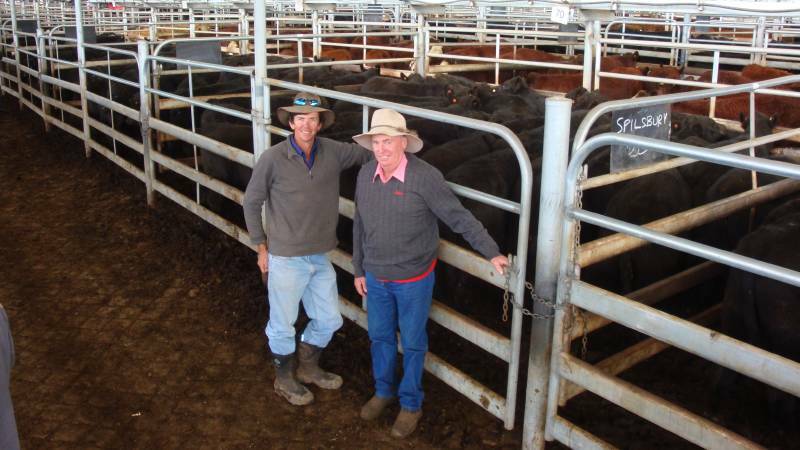 The records for commercial Angus cattle continue to tumble with $4,100 paid for a pen of 5 Angus cows with calves offered by Gary and Julie Buller at the Monterey Ladies Day sale, Karridale WA. Purchased by Rob Italiano, Harvey WA, the cows had calves at foot by Vermont E193. The #AngusPremium continued around the saleyards with Angus steers in Armidale hitting 479c/kg and Angus heifers at Mt Barker WA, 472c/kg. Top Image: Dave Taylor, manager of “Wiluna”, Wandsworth, owned by Frank and Jill Spilsbury, with Wayne Jenkyn, Elders Armidale.